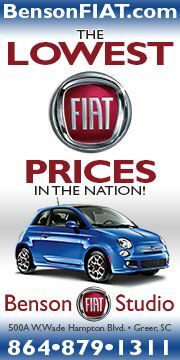 Found on the official Fiat USA Facebook site are two photos of what appear to be the US version of the Fiat 500. It shows a new style bumper, what I would call a hybrid of the regular Fiat 500 and the 500 Abarth's bumper. You can view the pictures here. (I apologize for not posting the pictures, as I am waiting to get the official OK to do so). 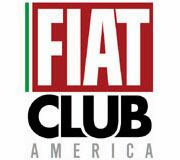 Update April 20, 2010: These photos have been deleted from Fiat USA's Facebook page, I was asked and have removed the link to them as a courtesy. Update June 8, 2010: automobilemag.com has posted spy shots of the US-Spec Fiat 500. You can view them here. These photos show a car not noticeably different than the Euro-Spec 500. 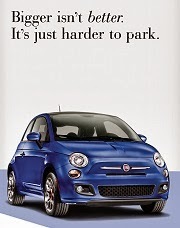 This is at odds with the photos previously posted on Fiat USA's Facebook site. This is intriguing and we'll have to see if the hybrid front end shows up again. . These pictures were found in the public Facebook photo album titled "Fiat USA Vehicles". The pictures appear Photoshopped or retouched, but they are definitely not the Euro bumpers found on a regular Fiat 500. The shape is similar to the 500 Abarth's bumper. 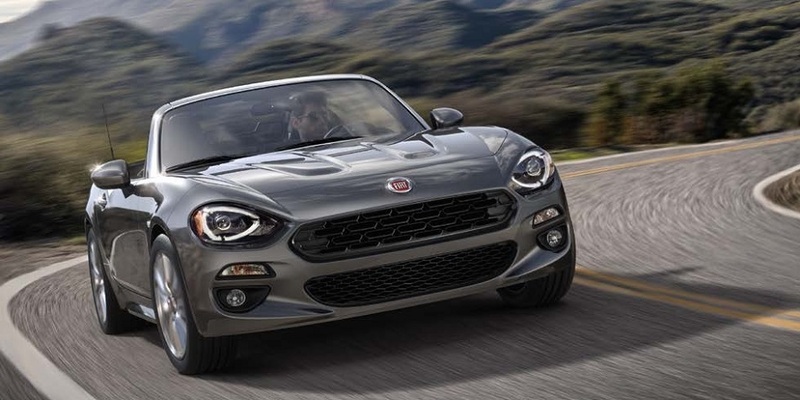 Essentially, it looks like they took the Abarth's bumper, minus the side air vent, and combined the lower grill, chrome bumper strip, and Fiat logo of the regular 500. 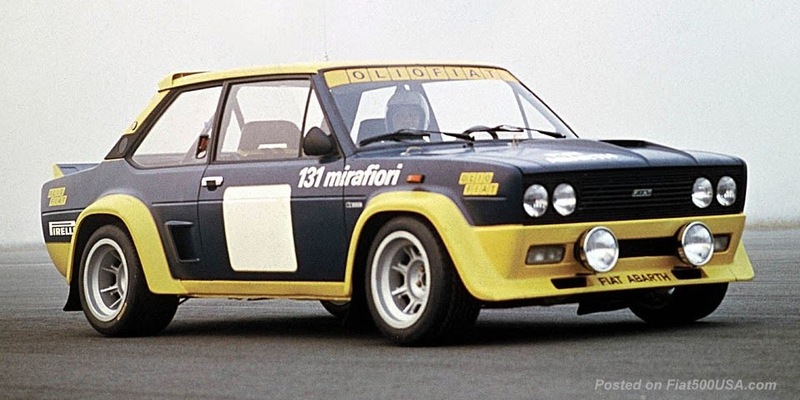 To make it easier to visualize, look at the Euro 500 and 500 Abarth bumpers and compare them to the pictures in the above links. I suggest you open the links in another window to follow along. 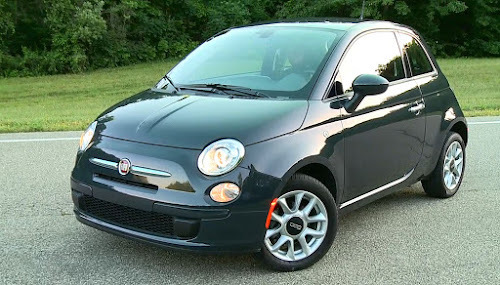 1) The lower grill on the US version of the Fiat 500 is wider. You can get the idea with the above pictures (pardon my crude attempt at Microsoft Paint). 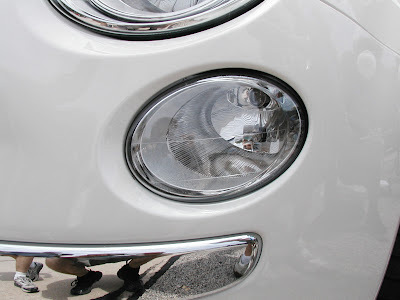 2) On the US version of the Fiat 500, you'll see a character line that runs along the bottom of the high beam light just like on the Abarth. This crease is not on the Euro 500. 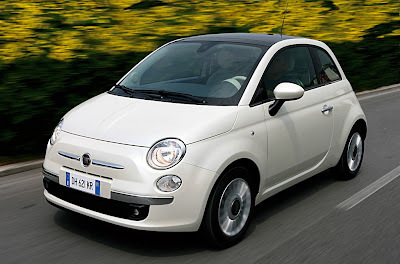 3) The US version of the Fiat 500 bumper shape projects out like the 500 Abarth's bumper. The Euro 500's bumper is more blunt. On the Abarth, this is done to accommodate the intercooler for the turbocharger, on the US version this could be for bumper impact standards and to accommodate a side marker. Is it possible the high beam will be moved into the headlight housing and the lower light converted to a side marker? The US version of the 500 is listed as 76mm longer than the Euro version. This bumper projection might help explain the the differences between the lengths I reported last week at the 2010 New York Auto Show. You can read that story here. Look at the dimensions above and compare the overhangs at the front. 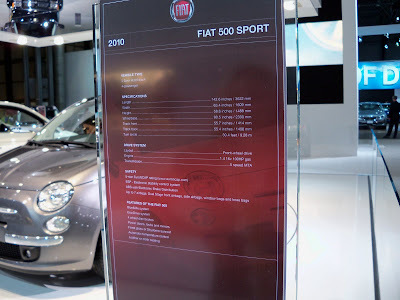 The US spec sheet at the Auto Show showed the 500 to be 3622mm long, very similar to the 500 Abarth's 3657mm. At this point it's all speculation, but those pictures on Facebook are very interesting. This could be just a design proposal, again, we'll have to wait and see, but it is getting near crunch time as training and manufacturing will have to start soon. I think it looks great! It combines the best features of the regular 500 with the Abarth's. I'll post these pictures here to make it easier for everyone to see as soon as I get the OK from Chrysler (hint, hint). Look at the interior of the cars on the pictures. This is not Photoshopping. these are computer generated images (3D Studio, Renderman, that kind of software). So these cars don't exist in reality yet, they could be the actual U.S. 500, but also internal proposals. Yes, there are a lot of things going on in those pictures. Fiat is a leading proponent of 3D modeling, so it wouldn't be a surprise if they didn't exist (at least with that front end). As we have both said, this could be a proposal and not a final design. One thought I have is, because of the high cost ($10 million) to change the bumpers (and tailgate) for US specs, Fiat might just use one bumper that fits the 500 AND the Abarth. An Abarth version could easily have a new lower grill and trim added. The extra space for the intercooler would already be there. Hmm, I like that idea. This leads me to believe that in the US we'll get a turbo at launch, but an Abarth would come later on (which would make the choice really painful). Not only might these bumpers allow for different crash standards, but they may also allow for a 1.4 turbo in the a 'base' 500. Americans love power so it wouldn't surprise me if they offer the Abarth in the way that BMW's Mini offers the factory JCW kit directly now. I would think the same tooling could manufacture the US-spec base 500 bumpers and the Abarth versions if the only real difference is the vents. That's a possibility. Maybe a 135hp option for the 500 and the full 170hp for the Abarth? Well, currently the car is sold in Europe with a Fire 1.4 with 100hp. That engine does not have Multiair yet, which will no doubt be added soon. If we look at the Punto Evoluzione which already has the Fire 1.4 with Multiair we can choose between 105hp and 135hp. So those are likely also the options to choose from when the 500 goes Multiair, and no extra engineering is necessary for the U.S.
For Abarth, keep in mind it is a racing brand and that means different tradeoffs can be made, for example CO2 emissions are not that important as for the normal 500. An engine upgrade to 170hp is very logical for Abarth. 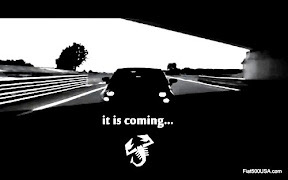 Consider it likely that FIAT wants the keep the Abarth version exclusive and will use the pricing instrument to do so. Visually speaking the new bumpers look good, except for the fog-lights and the the fog-light-blanks. Both look like bad after-thoughts and give the bumper a cheap appearance. no doubt mini cars are more affordable and more fuel Efficient than the other ones. Just griping due to Ford and Opel designs. I wish Ford would just ship Opels over here instead of thinking Americans want a different design. I'll get off my soapbox. Great site. Enjoy your website. :)"
I agree with you, I've always liked the Euro versions of cars sold here. I'm old school, so when I would buy an Italian car, the first thing I would do is convert it back to (or close to) European specs. I'm into personal responsibility and not government regulations. We've lost the chance to drive so many great cars here, it's enough to make a car enthusiast cry. If you can ride a motorcycle legally, why can't you drive a Lancia Stratos? Having said that, the differences between Euro specs and US are not as great as they used to be, so I'm keeping an open mind. For example with the 500, we're getting the bigger engine and possibly the upgraded platform. If it has an Abarthized front end, it will be different, but the Abarth is cool so I can deal with it. The Abarth/US (for lack of a better term) front bumper looks tacked on, cheap, and breaks up the line of the front end's design. 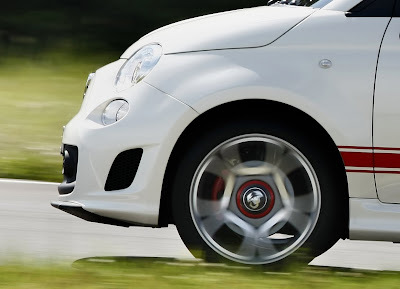 The new 500 has a nice clean look, and stays pure to its heritage design, that Abarth/USA bumper would spoil it for me. I REALLY do NOT like that "hybrid" bumper. The best part of this car (to me) is that it is a nice update on the classic Giacosta body style. The hybrid bumper and character line bulks up the front end, and clutters its overall appearance. Not sure if it's a cost-cutting, standardization issue, but it changes what is otherwise a terrific shape and style, especially for a new car. I'm very much enamored with this Italian car, and they way the original 500 was so faithfully re-interpreted. Bastardizing it for the American market will have me buying a Mini instead.